Nexter, a company of KNDS, asserts its position as a global land defense player in the digital world by presenting advanced digital solutions and systems on this edition of Eurosatory taking place in Paris from 11-15 June 2018. Through the TITUS® mission orchestration, the group demonstrates all its expertise to combine the best of technology in the field of vetronics, connected vehicles (continuity of combat mounted/dismounted), onboard simulation, robotics and command systems, for greater operational efficiency. Mastering the entire spectrum of the land sector gives Nexter the ability to identify a large part of the field of action in modern hybrid conflicts (mixed use of autonomous platforms and manned devices) and to better respond to asymmetric threats. Thanks to its integrating architect skills, the group offers operators increased operational capacities: on the ground with a Nerva® robot (IED detection, suspicious object ...), upwards with a captive drone (charging autonomy, cyber protection) and further more with an autonomous drone. The operator, equipped with a connected headset and a tablet, télé-operated weapons systems (medium-sized cupola) from inside or outside of the combat vehicle. The reported information is available for the digitized command post, allowing faster decision-making and keeping pace with the maneuver. With the future integration of the OPTIO® robotic system to the TITUS® mission orchestration, Nexter group will have taken a new step towards the development of hybrid operating systems in which the supervised autonomy of drones and satellite robots provides the means (sensors and effectors) of an even higher operational efficiency to the humans. Nexter, the leading French land defense company and third European player in the ammunition sector is part of the KNDS Group. It is dedicated to meet the needs of the French land forces and of Nations on an international scale. The scope of its business also includes the supply of weapon systems and ammunition for air and naval forces. In addition, Nexter provides systems and protection solutions in the field of homeland security. The group continues to apply its international development policy with 58% of the order intake in 2017 intended for the export market. 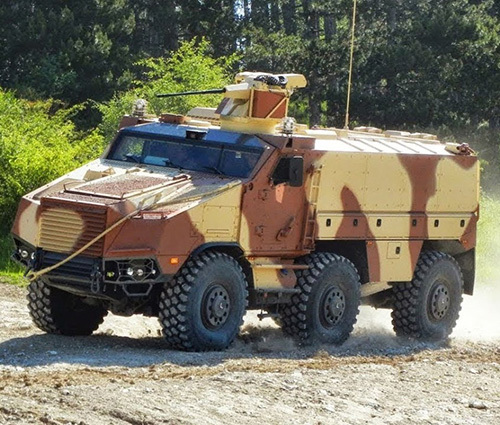 In France, Nexter is fully committed to meeting the objectives of the SCORPION program, through the upgrade of the Leclerc tank and the development of the future VBMR Griffon and EBRC Jaguar vehicles within the temporary business venture between Nexter, Thales and Arquus, as well as the Lightweight VBMR. The group’s range of products also includes ARAVISÒ, TITUSÒ and VBCI armored vehicles, CAESAR Ò, TRAJANÒ and 105LG1 artillery systems, smart ammunition (BONUS), many equipment, as well as customer service, support and revaluation. Nexter’s 2017 turnover amounted to €900 million, of which 18% is allocated to Research and Development (R&D) activities.